Tartelette Palette: When it doubt for a look, this has been my go-to palette to start if not complete an entire look with. I’ve loved it since I got it. I have no trouble complementing my other palettes with this one, and I love using it in combination as well as all on its own! If you haven’t seen my review yet, click here. CeraVe Moisturizing Cream: It took a while for winter to truly rear its ugly head but eventually it did here in Wisconsin and my skin has been in turmoil ever since. This lotion is my saving grace and I don’t know what I would do without it. It’s a nice, thick cream that dries to a matte finish in relatively little time. I use it during the day underneath my moisturizer with sunscreen, and certainly before bed either on its own or under a thin later of Vaseline when I feel that my skin is particularly dehydrated. I personally get the 16oz tub which will last you forever but it also comes in a 12oz pump version if you’re worried about keeping it sanitary. IT Brushes for Ulta: Remember how I mentioned that I skipped out on Sigma’s Black Friday/Cyber Monday sale? These were the reason why. It started simple, with their Airbrush Blending Crease Brush #105, and that’s all it took to get me hooked. In total I now own the You’re Easy On The Eyes Dual-Ended Eye Shadow Brush set, the Live Beauty Fully All Over Powder Brush #211, the Velvet Luxe Soft Focus Sculpting Brush #315, the Velvet Luxe Buffing Foundation Brush #301 and the Velvet Luxe Plush Powder Brush #313. I’m planning on making a separate post about these soon but I just have to say that all these brushes are just so incredibly soft. I mean, the Velvet Luxe part of the line is just divine. I encourage each and every one of you to go to Ulta and just feel these up, I mean it. theBalm Overshadow in No Money, No Honey. Swatched over bare skin. theBalm Overshadow in No Money, No Honey: I received this as a “glam” prize on r/RandomActsofMakeup and it really lives up to the hype. 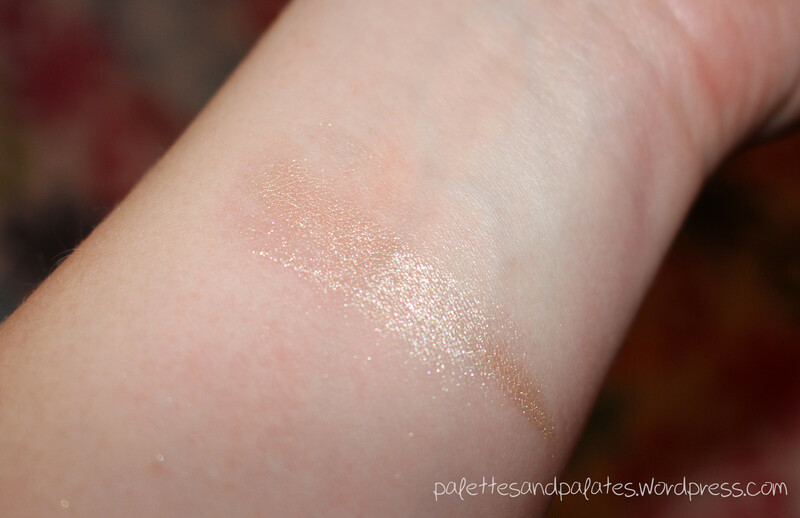 It’s a beautiful shimmering gold color that I love using as an inner corner highlight as well as a face highlight. It’s my first product from theBalm and I’m already itching for more! 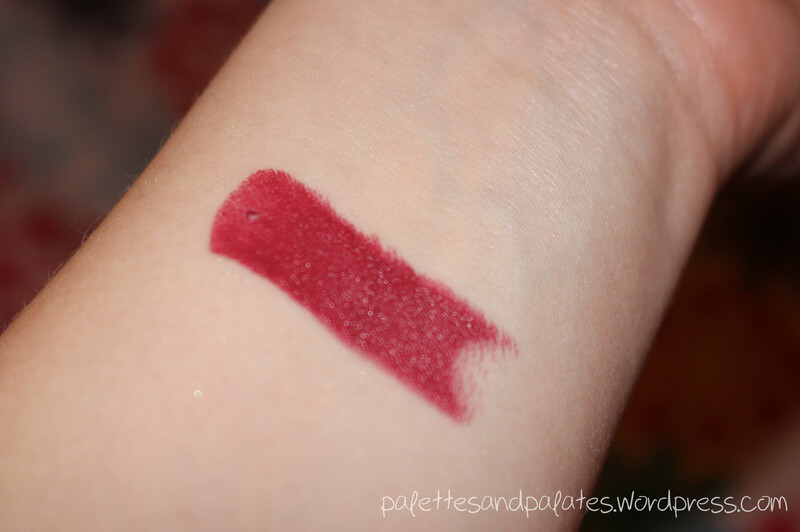 Swatch of NARS Audacious Lipstick in Audrey. NARS Audacious Lipstick in Audrey: I had to have this color as soon as I saw it because a) it’s named Audrey, like Audrey Hepburn, so duh, and b) the color is gorgeous and unlike any red I had yet in collection. The shade is described as “red currant”, and is a muted red-plum color that I just fell in love with. It was an easy choice for my Christmas lip color pick. I’ll also be doing another post on this one later, along with the NARS Audacious Lipstick in Grace. Seroogy’s Chocolates: Straight out of De Pere, WI, these are some of my favorite chocolates, and they hold a special place in my heart because they too are from Wisconsin but also because one of my fundraisers in elementary school was selling their chocolate bars. At the time, my family lived in an apartment building where my parents worked as maintenance managers, and I made serious bank selling these candy bars to all the elderly people in the building. My boyfriend got me a whole box of assorted truffles for Christmas as well as a package of their chocolate dipped potato chips. I just… he knows me so well, you guys. They’re giving my comfort while he’s all the way out in San Francisco for the next couple of months. Anything packed with protein: I slacked a lot on my diet over the holidays (shocking, I mean who does that?!) but have thankfully kept up with my new weight lifting regimen. At the end of November, I started the program from The New Rules of Lifting for Women and just recently started Stage 2. After having done so much cardio for so long, it is so nice to fall in love with lifting, and I’m slowly seeing results! The biggest thing that’s going to help, along with maintaining a clean diet, is packing my diet with protein. Whey protein, things like Quest bars, chicken and eggs are some of my besties right now, and peanut butter is my one and only, forever and ever. I’m sure I will slowly gather plenty of protein-enriched recipes that will make their way here to the blog. If you have any to share, please do! What are some of your favorites from the month? Feel free to share them in the comments below!